The Old Bait and Switch. The 2nd Oldest Profession? Whats up with Seller’s who think it is totally acceptable to switch out appliances before closing? I just don’t get it. It seems to be a serious problem these days. Case in point, a home is sold with one year old appliances but upon taking possession of the home the new owners find that the appliances have been switched out for lesser, and older, models. There have been a number of discussions on this topic in real estate chat rooms and Facebook groups but for some reason, and only in extreme cases do these situations ever end up in court. Recently I heard of a central vacuum unit being switched out for something obviously much older. Step one; The Buyer complains to their agent who in turn calls the selling agent who says they don’t know anything about it and never follows up with the Seller. Step two; The Buyer calls the lawyer to complain. He calls the Seller’s lawyer who tells the Seller to deal with it. Nothing gets resolved and in the end, the Buyer purchases a new one or the Buyer’s agent makes it a lovely house-warming gift. End result? Seller has a new central vac unit to replace the crappy one that is in his new house. How many times have you heard this story? Fridges, stoves, washers, dryers, light fixtures, drapes…pretty much anything you can think of. In researching this blog I came across this classic story about the Seller swapping out half the house, including replacing a fridge with one from china that couldn’t even be plugged into the wall. The fraud, yes, let’s call it what it is, was so extreme that the judge awarded the Purchaser nearly $15,000 to replace the things defective or missing plus $10,000 in punative damages. Rack one up for the good guys. Read the whole story here….http://aaron.ca/columns/2003-09-27.htm and pay particular attention to the last four lines about Sellers who try this stunt in the future. So here is the problem….are you going to go through all this for a $500 or $600 item? A similar thing happened to me several years ago. I listed a beautiful condo that had been completely renovated including a stunning kitchen with stainless steel appliances. After the condo was sold the Buying agent called to tell me that the fridge door had a huge dent in it. I had never noticed it as the Seller had beautifully disguised it with fridge art (neatly taped up clever cards with witty sayings, etc). So I called the Seller and asked what’s up with that? Her response was “oh, I bought that fridge at a scratch and dent sale, the Buyers should have paid better attention”. Yeah ok. So I did the right thing. I bought a new fridge door and had it installed. Happy Buyer but I was down $600. 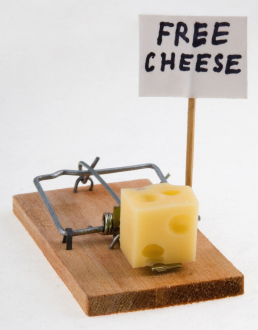 Bait-and-switch is a form of fraud used in retail sales but also practiced in other contexts. First, customers are “baited” by merchants’ advertising products or services at a low price, but when customers visit the store, they discover that the advertised goods are not available, or the customers are pressured by sales people to consider similar, but higher priced items (“switching”). It is also used in real estate to describe the replacement of appliances or the more serious practice of advertising something that is too good to be true in order to pick up potential clients. I won’t get into that one today. Let’s stick with the case of the switched appliances. Does this story make you stop and think about your obligations to your buyer or seller? How could you avoid potential litigation? Use your phone to snap pictures of the appliances. Sure there are privacy laws that will limit what we can or cannot record so you could ask for permission with a clause in the offer that essentially says “Seller agrees to allow pictures to be taken (during the inspection) for the sole purpose of documenting and recording the list of inclusions in this real estate transaction”. If video taping or pictures are not an option, try voice notes (available on Evernote). Insert a clause that says that no replacements or substitutions of fixtures or chattels shall occur prior to closing. While it is often difficult to do you could also include a clause that gives the Buyers permission to enter the premises a day before closing. Include the feature sheet as forming a part of the Agreement of Purchase and Sale with some wording about chattels and fixtures. At the end of the day, our job is to protect our buyers and sellers. We cannot assume that the parties to every transaction will be fair and honest. It’s a sad state of affairs when we need to document that insignificant little light fixture or basement wine fridge but at least we have the technology to record things quickly and continue to prove our worth. Sellers should be aware that they form a contract. And Buyers usually own digital cameras — use them. And agents, if the buyers don’t use their camera, use your’s. This kind of “me first” behaviour on the part of the sellers has to stop. Buyers- roll back rugs – take art off refrigerators, look behind large pictures or wall hangings and take pictures of everything. Just because some house prices have declined is no reason for sellers to start committing fraud in order to try to get close to their buying price back into their pocket. The buyer should ALWAYS have the right to a pre-closing inspection – sometimes just hours before the close. And if you have to, sit on the doorstep to make sure no one else comes in. Protect yourself! Why not just add a default line item or chattel box, listing all items and just fill it in with the “Item”, “make”, “model”, “year”, Colour”, etc. and maybe a reference line item of either referencing pictures and/or videos. This is the best way to protect your buyer. I also agree with Barbara, you want to be a top sales person and stand out, do your due diligence on behalf of your client and record all items. That being said, it will be worth paying agents the 5% – 6% they deserve – where have those days gone? Oh yes, the fly-by-nighters screwed it up along with TREB ‘giving in’. But that’s a whole other can of beans. I like the idea of taking pictures. We have discussed that and there are some privacy issues (which sounds nuts, but there you go). marking down all the serial numbers makes the most sense even if it takes a long time but as you said, it is the best way to protect your client. Perhaps the onus should also be on the selling agent to provide a list of appliances with serial numbers. Just saying.